Blake Heath along with his friend Brett Emison obtained a jury verdict in favor of their client after she fell at a Grain Valley, Missouri floor and tile store. The client had gone to the store to purchase products for two investment properties. Her primary objective was to find hardwood flooring and establish an ongoing relationship with a supplier. On May 15, 2012, the client went to the store and was greeted in the showroom by the sale’s manager, who also happened to be the son of the vice president of the company. After spending a few minutes in the showroom, the client was led to a warehouse behind the main showroom. The client was invited by the sales manager to go to the warehouse, but at trial the sales manager tried to imply that it was the client’s idea to go to the warehouse. On the way back from the warehouse, the client fell right in front of a loading ramp. The fall was captured on video. 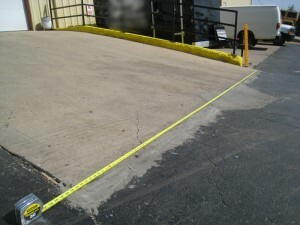 The loading ramp itself was concrete, but the area where the client fell was asphalt. Immediately after the fall, the sales manager pointed out a pothole and said the pothole caused the fall. However, he denied every saying a pothole existed during the trial. This was a tough fought case on both liability and damages. The client filed a premise liability lawsuit against the business owner. During discovery, Blake Heath got admissions from several employees that a “depression” existed in the area of the fall. Mr. Heath retained a safety engineer to get measurements of the area, but by time he arrived the defendant business had altered the condition of the asphalt. The expert was able to determine that as of May 7, 2014, a ½ inch depression existed in the area where the client fell. Defendant argued the alterations were necessary because the area had gotten worse in the two year period prior to the plaintiff’s expert arriving on scene. The defendant also tried to argue that there was no way to know the depth of the depression when the client fell. Regardless of the depression, defendant claimed the real cause of the fall were numerous other factors such as the client’s weight, her shoes, her purse, and prior medical conditions. Defendant denied the condition of the property had anything to do with the fall. As a result of her fall, the client had a broken ankle. She had surgery shortly after the fall. At the time of trial, the client was still experiencing discomfort and swelling in her ankle. The defendant only offered $25,000.00 prior to trial. Blake Heath did not feel this was adequate compensation for his client so instead of settling cheap, he took the case to trial with Mr. Emison. The jury came back with a $75,000.00 verdict in favor of Mr. Heath’s client assessing 60 % of the fault to the negligent business owner. This case is a great example of why it is important to hire an attorney willing to take a case to trial if an insurance company is not willing to put a fair settlement on the table.